Great Harwich Port location! Central A/C. Walk to downtown and Bank St. beach from this remodeled 3 bedroom home with 1 ½ baths. Plenty of natural light enters this home. The large picture window in the fire placed living room overlooks Harwich Port golf club. Sleeps 7. Bedrooms are spacious with 1 king, 1 queen & 2 twins. Fully equipped kitchen, breezeway leads to the large, private patio area with outdoor seating & gas grille. An additional family room with large flat screen TV and day bed for additional sleeping is perfect for more family space. $9,500 per week. Guest house $1,500 per week if rented with main home. Only .2 mile to Merkel Beach. 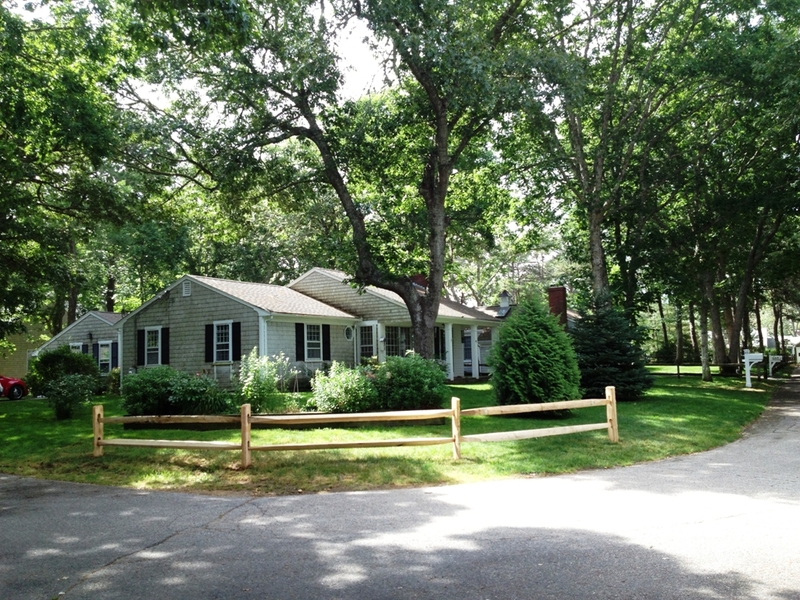 Charming, Gorgeous family retreat in Harwich Port with views of scenic Wychmere Harbor, privately set back on 2 acres. Sprawling emerald front lawn & front terrace allow for views of the Harbor. Enjoy warm summer days in the shaded sunken garden with Koi pond & patio area. The estate consists of the main house “Stepping Stones” with 7 bedrooms, 4 ½ baths & approximately 4,000 square ft. of living space. “Pebbles” is the very lovely 600 sq. ft. guesthouse just 125 feet away from the main house, completely renovated with one large bedroom with king size bed, full bath with claw foot tub & shower, open floor plan includes a cozy living room with gas fireplace, lovely dining area surrounded by windows with seating for 6 people, fully equipped kitchen with farmers sink. The couch in the living room opens to a queen size bed for additional sleeping if needed. An outdoor shower & tub, patio & gas grille are also here. The main house is air conditioned & has been lovingly maintained. The spacious gourmet kitchen has been updated, with large kitchen island, double ovens, stovetop, countertop seating, fireplace & dining area for 8 people. Butler’s pantry leads to the spacious, fire placed dining room and dining table with seating for 12 guests. Two sets of French doors in this room lead to a large, welcoming sun room with fire place & comfortable furnishings. The fire placed living room with distinctive post & beam ceiling is warm, welcoming, spacious and relaxing ,a perfect place for gathering with family. Doors from the kitchen & sunroom lead to a beautiful patio, mature plantings, grassy lawn & outdoor shower. There is a bedroom on the first floor bedroom with 2 twin beds. A shared half bath is easily accessible. In the rear of the home on the first floor is a second kitchen, sitting room with pullout sofa, & staircase leading to 2 cozy sunlit bedrooms with 1 king size bed & 2 twins. A There is also a full bath with tub & shower in the rear quarters of the home. A second staircase leads to private bedroom with 2 double beds & full bath with step in shower. There is an adjoining room with toddler size bed. The third staircase brings you to 3 bedrooms, the master bedroom that faces south with Harbor views, king size bed, fireplace, large walk in closet & spacious full bath with tub & shower. Bedroom 2 also faces south with views of the Harbor, king size bed & crib. Bedroom 3 is cozy with 3 twin beds. Also upstairs is a large shared full bath with tub & shower. The laundry room is located on this floor. Stepping Stones is .2 mi to Merkel beach on Nantucket Sound, a short walk to downtown Harwich Port, many wonderful restaurants, variety of shops, art galleries & Ice cream parlors and so much more. Enjoy your summer vacation, relaxing with the entire family from this truly special home.